Amma went from the press conference in to a sound studio where PBS (Public Broadcasting System) filmed an interview for an upcoming documentary. Her eyes sparkled and Her smile melted the interviewers. Amma indicated that there needs to be a reawakening of Motherhood in society, that children are more naturally attached to the Mother than the Father, and the responsibility for the moulding of a future generation lies with the Mother. She went on to say that this is both an opportunity and a challenge – women must learn to develop their nurturing self and their patience. Women must also spend more time with their children, for peace in the future is predicated on proper upbringing of children today. 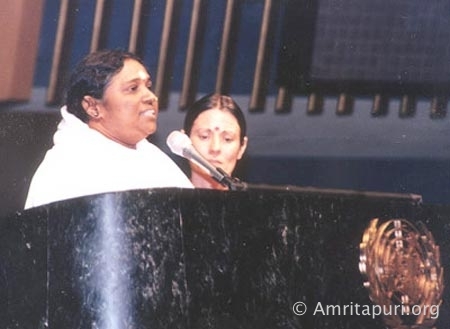 Amma also provided an insight into Her own childhood experiences that were instrumental in awakening the God consciousness within Her, even at a very young age. Despite the fact that She grew up in a very small village that had no spiritual inclinations, Her spiritual awakening came from observing the abject plight of the suffering poor. She told how She went to collect the tapioca husks for the cows and as She went from house to house, She observed that often people had nothing to eat and were starving because their food came from the ocean and if there was no catch that day, they didn’t eat that day. She also observed the lack of real love between the family members. 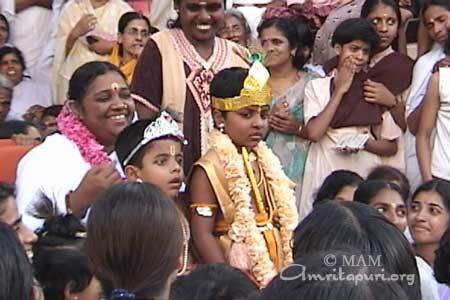 This caused Amma to reflect on the meaning of real love and what the origin of suffering was. 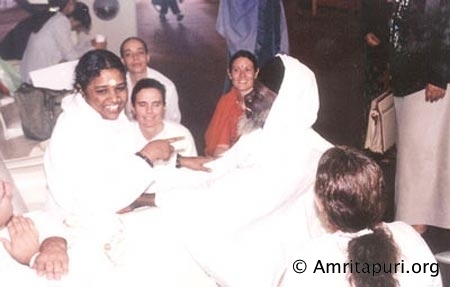 This contemplation combined with compassionate efforts to help the villagers awakened the consciousness of the Divine in Amma. 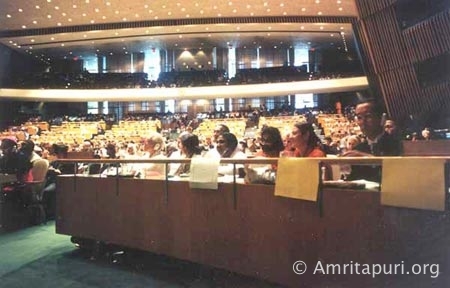 The BBC (British Broadasting Company) journalist also wanted time with Amma, so she came to the suite and taped Amma’s responses to a variety of questions as Swamiji translated. “Salutations to all gathered here, who are verily the embodiments of love and the Supreme Self. We have stepped into the new Millennium with great hopes and expectations of change. But though the numbers denoting the year are different, essentially nothing else has changed. The real change must happen within us. For only when conflict and negativity are removed from within, can we play a truly constructive role in establishing peace. 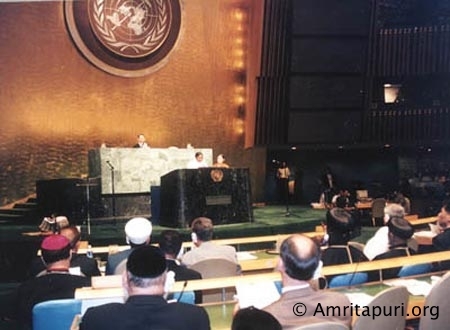 With the goal of peace in mind, the invaluable efforts of the United Nations to bring nations together, thereby creating peace and harmony, merit heartfelt praise. The very words ‘nation’ and ‘religion’ imply division and diversity. This diversity may seem to create obstacles in fostering peace, happiness and prosperity in the world. Yet, in reality, it is this diversity that brings richness and beauty to the world and to human life-just as a bouquet made of flowers of a variety of colours is more beautiful than a bouquet of flowers that are exactly the same. As I travel around the world, people come to me and share their sorrows. Some have told me that a husband, wife, or child had been killed in a religious clash. Sometimes it was a fight between Hindus and Muslims, other times between Hindus and Christians or between Christians and Muslims. It’s so painful to hear. The reason for the fighting is that people are not going into the depth of their religion. Our ties to a religion, society, or country should not make us forget our basic human values. We are living in an era in which science and modern communication have turned the world into one small community, reducing the barriers of time and space. The latest developments in the field of telecommunications keep us informed instantaneously of events occurring in any part of the world. Events in one part of the globe affect the entire planet to a greater or lesser extent. Although the world has become closer through technology, we have not drawn closer in our hearts. For example, members of a family, though physically close, are often like isolated islands. Today, we are capable of destroying the earth in an instant. But we also have the innate capacity to create heaven on earth. The future of humanity depends on the choice we make. Societies and nations are comprised of individuals. If we look back through history, we can see that all conflicts originate from conflict within the individual. Where lies the origin of conflict? It is the lack of awareness of our true nature, the one living power within us, of which we are all a part. The role of spirituality, true religion, is to awaken this awareness and to help us develop such qualities as love, empathy, tolerance, patience and humility. Religion is the science of the mind. Today we are able to air-condition the external world, but we have yet to learn how to air-condition the mind. We are trying to clone human beings, but we do not attempt to create within ourselves a perfect, loving and peaceful human being. An important role of religion is this purification process. Though the founders of all religions realised and practiced the noblest ideals in their lives, many followers have failed to live up to them. Instead of focusing on the essence of religious principles of love and compassion, we focus on the external rituals and traditions, which vary from religion to religion. That is how these religions, which were originally meant to foster peace and a sense of unity among us, became instrumental in spreading war and conflict. This does not negate the importance of religious disciplines and traditions. Indeed, they have their own significance. They are necessary for our spiritual development. But we must remember, these traditions are the means to the goal and not the goal itself. Suppose a person has to cross a river by boat. Upon reaching the other shore, he has to leave the boat and move onward. If he insists on clinging to the boat, his progress will be hampered. Similarly, we have to give more importance to the goal of religion and not be overly attached to the means. We should remember that religion is meant for humanity, and not humanity for religion. To solve the complex and controversial issues such as religious freedom, conversion, and fanaticism, the religious leaders must come together in dialogue with open hearts in order to arrive at mutually acceptable, practical solutions. However, for such discussions to be fruitful, we must first plant the seeds of love, peace and patience within ourselves. To achieve lasting peace, we must strive to rid ourselves of hatred and hostility. The key to world peace is within every individual residing on this planet. Just as each member of a household shares the responsibility of safeguarding the home, each one of us shares the responsibility of world peace. Peace is not just the absence of war and conflict; it goes well beyond that. Peace must be fostered within the individual, within the family and within society. Simply transferring the world’s nuclear weapons to a museum will not in itself bring about world peace. The nuclear weapons of the mind must first be eliminated. All the great religions have infinite wisdom and beauty to share. Instead of trying to increase the number of followers, religions should create an environment in which one may wisely accept the noble ideals of any religion. Tomorrow’s world will be shaped by today’s children. In their tender minds, it is easy to cultivate universal human values. If you walk through a field of soft, green grass a few times, you will quickly make a path. Whereas, it takes countless trips to forge a trail on a rocky hillside. The teaching of universal spiritual principles and human values should be a standard part of the general education, not only the responsibility of the family. This should not be delayed any further, for if there is delay, the future generations will be lost to the world. We cannot lose sight of the essential needs of people, for until these needs are met, it is impossible for anyone to aspire to higher states of awareness and understanding. If, in any part of the world, people are dying of hunger or suffering in poverty, it is a matter of shame for all nations. Based on the religious ideal of universal brotherhood, all nations that are in a position to help should share their material wealth and resources. There is enough for the survival of all living beings on this earth, yet not enough to satisfy the greed of a few. Lending a helping hand to a neglected soul, feeding the hungry, a compassionate smile towards the sad and dejected-this is the real language of religion. We should invoke God’s compassion in our own hearts and hands. Living only for oneself is not life, but death. Some may say that the world will remain the same no matter how hard we try to change it. Striving for world peace is as useless as trying to straighten a dog’s curly tail. However much one may try to straighten it, the tail will immediately curl back. Yet, through constant effort, we will build our muscles even if the tail doesn’t become straight. In the same way, regardless of whether we fail or succeed in bringing about world peace, we, ourselves, will change for the better. Even if there is no visible change, the change in us will eventually effect change in the world. Furthermore, whatever harmony exists in the world today is a result of such a force. We must learn from the past, or we will repeat our mistakes. Those who have harmed others in the past should now engage in positive actions to uplift the victims of their past oppression. These principles apply to governments as well as to individuals. Each nation should foster an atmosphere of forgiveness, openness, friendship, trust, help and support to heal old wounds. In order to heal the wounds, broken relationships should be stitched with the thread of love. For this, more than intellectual knowledge, we should have awareness about our oneness. Let us focus on what we can give to others-not on what we can get for ourselves. Only then, can we bring about a total transformation in our global family. Thus, by living the ideals of religion, we transcend our narrow-mindedness, and our lives will become offerings to the world. 1) In God’s creation, men and women are equal. But over the centuries, the sad condition of women has not significantly improved. Women, who give birth to humankind, should be assured an equal role in society. 2) Millions of people are suffering from AIDS, which continues to spread like wildfire. This disease must be brought under control. 3) Let the UN lead the transformation from a world of conflict to one of peace by training a group of youth in community service. These young emissaries, serving selflessly throughout the world, will inspire people to cultivate universal spiritual and human values. What cannot be achieved through bloodshed, can be achieved through love. 4) Terrorism and violence against human beings in the name of any religion should be condemned at the international level and the appropriate strong action should be taken. Love is the only medicine that can heal the wounds of the world. Just as the body needs food to grow, the soul needs love to unfold. Love is more nourishing than breast milk is for a baby. Love is the very foundation, beauty and fulfilment of life. Where love exists, there cannot be conflict of any kind; peace alone will reign. May the light of love and peace shine within our hearts. Let us all become messengers of universal peace-illuminating the hearts of everyone, dispelling the darkness of hatred and conflict that has overshadowed today’s world. Let us all awaken to a new tomorrow, filled with universal love and brotherhood. 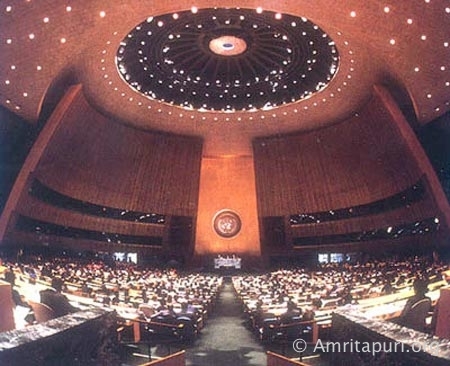 Is this not the goal and dream of the United Nations? May the Supreme Power bestow grace upon us that we may realise this noble prayer. Om Lokah Samastah Sukhino Bhavanthu. Om Shantih Shantih Shantih”. 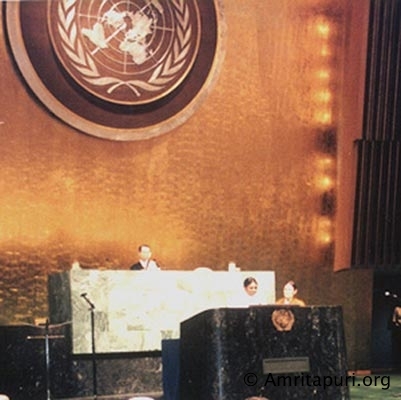 The second day of the conference started with an opening statement by Bawa Jain , the Secretary General of the ‘Millennium World Peace Summit’, an inaugural address by the Secretary General of the United Nations, Kofi A. Annan, and brief remarks by Ted Turner, Honorary Chairperson. And then it was time for the 30 main religious leaders to address the audience. Many of the speeches were longer than anticipated, and Amma’s speech was rescheduled to about 3:00pm, after lunch. 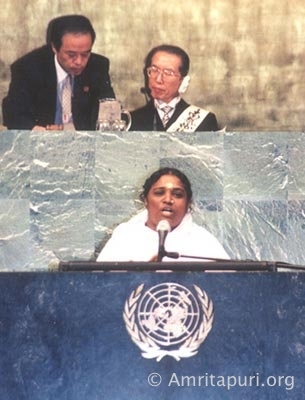 The break didn’t allow enough time to return to the hotel, and Amma didn’t want to go to the luncheon for the speakers, so She sat on a chair in the hallway between the General Assembly and the Security Council while 10-15 devotees sat at Her feet and the occasional person stopped by for a hug. 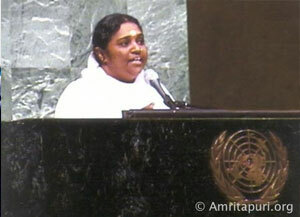 Despite the delayed speech and no lunch, Amma radiated peace and happiness. 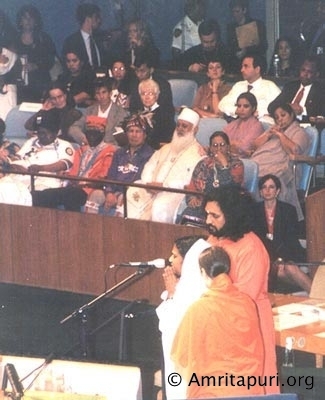 Swamiji, who was in a booth high above the main floor, was wearing headphones to listen to Mother as he read the English translation. It was impossible to say the English as rapidly as Amma said the Malayalam. Some of the points had to be skipped in the English translation. The audience fell in love. And as quickly as She started, it was over. 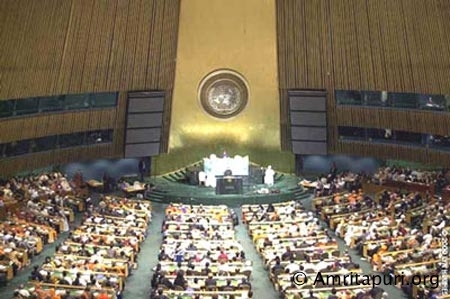 In most cases at the recent UN Summit, you could tell at a glance who was a delegate, and what religion she or he represented: Christian cardinals were in black and crimson; Hindu swamis were in orange; Tibetan lamas were in yellow and red; Jewish Rabbis were in black, and wore skull caps; Jains wore white, and had small masks covering their mouths. 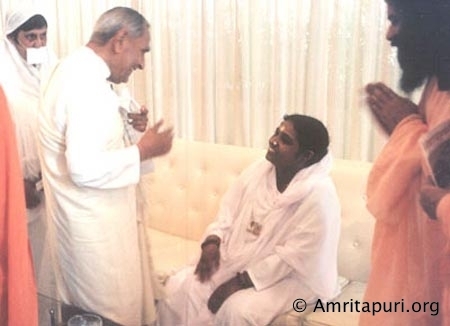 But in Amma’s case, some had to be forgiven for mistakenly approaching Swami Amritaswaroopananda Puri or Swamini Krishnamrita Prana, thinking they were the VIPs–their orange robes clearly marked them as sannyasins. Mother’s simple, plain white sari, with no insignia of rank or religion, was the exception in this chamber of colourful and imaginative dress. As always, she looked like any ordinary Indian woman, and her unpretentious bearing and manner were perfect disguises for the powerhouse she actually is. 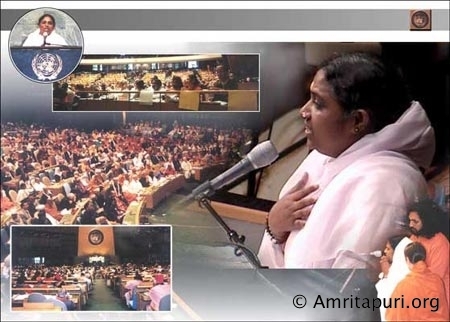 The moment Amma walked purposefully to the podium, and turned to address the assembly, her dynanamic Presence corrected any misimpressions that might have lodged among the religious leaders gathered there. With a voice full of strength and tenderness, with words bearing wisdom and humour, with a manner both confident and humble, Amma spoke, stressing that there can be no peace without if there is not peace within. 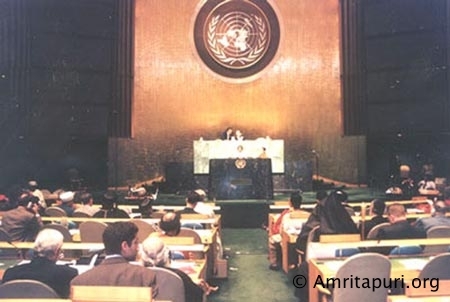 For the first time in the UN’s fifty-five year history, the language was Malayalam was heard in the General Assembly Hall ! 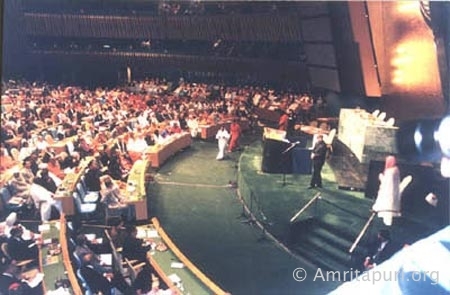 Departure for the U.N. headquarters was scheduled in Mid-afternoon, but a delay in the arrival of the U.N. cars meant Amma had to wait in the lobby of the hotel for 15 minutes. 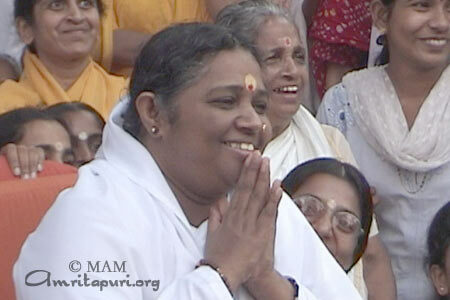 Immediately, a line formed, and Amma was giving darshan! 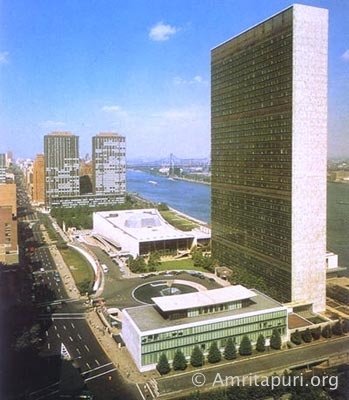 Upon reaching the U.N. building, children from many different cultures dressed in native costumes greeted the participants and their parties. The Summit began at 3:45pm. 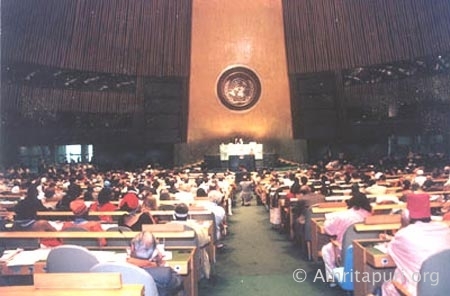 The General Assembly is a rather grand room with earphones at each chair so speeches can be heard in the five official languages of the Security Council. Japanese and Korean were also added for the Peace Summit. The opening ceremonies of the ‘Millennium World Peace Summit’ included prayers from the worlds preeminent religious leaders. 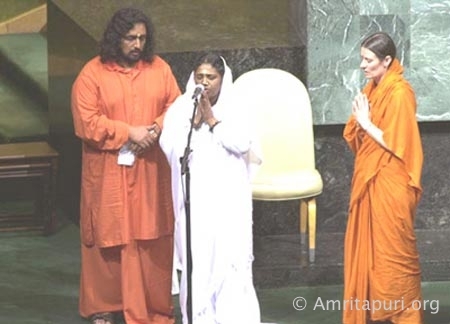 When the Secretary General of the Summit, Mr. Bawa Jain, requested Mother to grace the assembly with Her prayers, Swami Amritaswarupananda Puri and Swamini Krishnamrita Prana accompanied Mother to the podium. Swamiji said, ‘The Holy Mother will be chanting two prayers. The meaning of the first one is, “Oh, Lord, lead us from untruth to truth, from darkness to light, and from death to immortality”. Amma then chanted the prayers in Sanskrit. The festivities began at 6:30 in the morning with a special procession from the Main temple to a local seaside temple. A large number of ashramites, devotees and visitors took part in the procession, singing Krishna bhajans, clapping hands and dancing! The baby elephant ‘Ram’ was decorated to lead the procession, but it seemed the loud drums and horns were too startling for him! 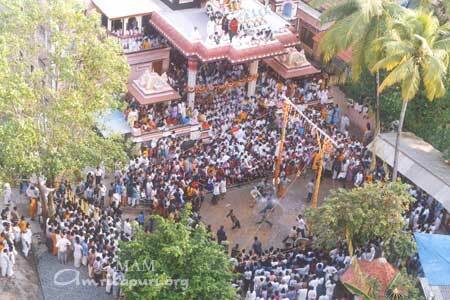 In the afternoon, crowds gathered eagerly to celebrate with Amma. Although the weather has been unseasonably rainy, the sun came out for Krishna’s birthday so that everyone could gather in front of the temple. Amma watched the children play at breaking swinging pots of water, a game reminiscent of Krishna’s escapades stealing pots of butter. First the little children played, then those a bit bigger, then young brahmacharis and computer students had their chance, too. Mother sat near the bottom of the temple steps, close enough that a bit of the water thrown at the ‘little Krishnas’ who were playing also splashed on Her! Amma watched the fun, laughing often and pointing out the most adorable scenes. She quickly became the concerned and disciplining Mother when the games started to get wild; then again, She became the tender, compassionate Mother when some youngsters got minor scratches and came crying for Her caresses. After the games, Mother went to Her room, returning almost immediately for the evening bhajans. The prayer hall was decorated with garlands and colourful balloons. 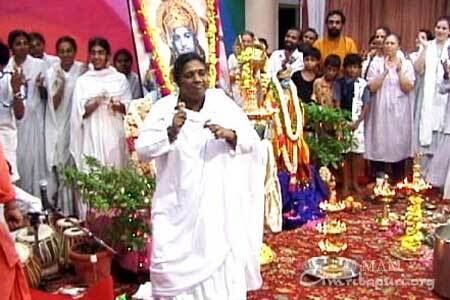 Led by Amma, the bhajans enchanted everyone present. 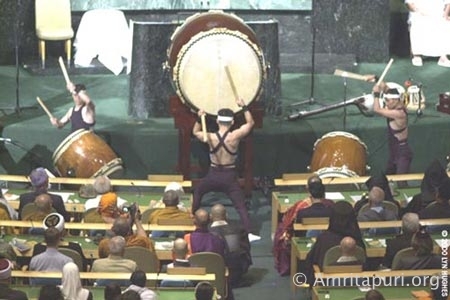 Shortly after, a cultural program took place. Mother and the entire audience were moved to gales of laughter as they watched a play by two western children and a mime performance by students from the nearby computer institute managed by the ashram. The computer students and some ashramites also performed many beautiful traditional Indian dances. At about 11:00 p.m., Mother moved from the prayer hall to the inner temple, where a reading of the Srimad Bhagavatam was taking place; and the special Balagopala Puja honouring the birth of Krishna began. The spot where Mother usually gives darshan served as the puja area, and was adorned with a beautiful Krishna statue, oil lamps, garlands, trays of flowers and a large painting of Amma as Krishna. With the added divine presence of Amma, the scene was extraordinarily beautiful. At the stroke of midnight, Amma started a special bhajan session with the traditional first bhajan for Krishna’s birthday – ‘ Agatanayi Agatanayi’. Clapping Her hands and smiling, She sang many other Krishna bhajans creating a very lively and playful atmosphere. At the conclusion of the puja, prasad was shared with all. Heeding the words of his children, the father agreed and divided all his property amongst them. It was decided that he would live with his sons, staying with each for two months at a time. So, when the partitioning of the land was completed, the father went and stayed with his eldest son. Hardly one week had passed when the attitude of his son and daughter-in-law showed signs of change. They began to neglect him. They treated him so badly that, long before the two months were over, he left them and went to stay with his second son. But there he fared no better. After only five days he had to leave them as well because he couldn’t bear the verbal abuse inflicted upon him by his daughter-in-law. His experience in the house of his third son was even worse. There, he was reduced to constant tears. Finally he took refuge in an ashram. When his sons heard this, their attitude towards him changed drastically. There are no words to describe the love they suddenly showed their father! Each son pleaded with him to come and stay at his house. Thus the father once again began went to stay with his sons, except that this time he was treated very well indeed! Finally the father died. His sons didn’t waste any time: they rushed to the box and opened it. But what a surprise they got when they found only a few stones inside the box! Once, when Brahma was in a state of deep meditation, Lord Vishnu blessed him with an idol of himself known as Ranga Vimana1. It said that Lord Brahma then gave the idol to Viraja. From Viraja it was handed down to Vaiswatha, then to Manu, to Ishwaku and then to Lord Rama. Each of these saints is said to have worshipped the idol in their day. After defeating the demon king Ravana in Lanka, it is said that Rama gave the idol to Vibhishana, Ravana’s righteous brother, for his support during the war. But when Vibhishana tried to take the idol to Lanka with him, he was tricked out of it by Lord Ganesha. Although Vibhishana was devoted to Rama and had helped him in the war, he was still a demon by birth. The gods did not like the idea of the Ranga Vimana being taken off Indian soil. Using the help of Lord Ganesha, they devised a plan to keep it in Bharat. When Vibhishana was passing through Tiruchirapalli, he decided to bathe and do his daily worship in the Kaveri River. But he was in a bit of a predicament, because Rama had told him that the idol would become permanently fixed to the ground wherever it was first set down. Not knowing what else to do, Vibhishana tried to find someone to hold the idol while he took his bath and performed his ablations. This is where Lord Ganesha came in. Disguising himself as a young cowherd, he offered to hold the idol for Vibhishana. Then when Vibhishana was bathing in the river, he set the Ranga Vimana idol firmly on the ground, where it is fixed to this day. Upon seeing the cowherd’s deception, Vibhishana ran after him. Lord Ganesha climbed up to the top of a large nearby cliff. But, there, Vibhishana caught him and struck him on the forehead. At that moment, Ganesha revealed his true form to Vibhishana, who immediately apologized2, asked for his blessings and continued on his way to Lanka. The area where the Ranga Vimana was set down by Vibhishana eventually was covered by a thick forest, and thus the idol was lost. It was re-discovered thousands of years later when a Chola king was chasing a parrot and accidentally stumbled across it. 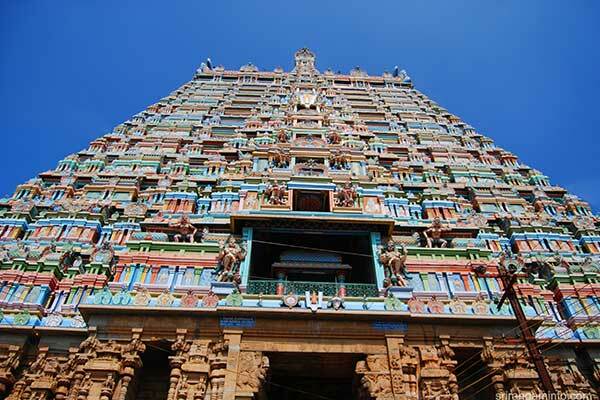 It was the king who established the Sri Rangam Temple, which today is one of the largest temple complexes in the world. The enormous rock Lord Ganesha climbed upon now forms the Uchi Pillayar Temple, only a few kilometers from Sri Rangam. This temple is one of the pancha bhuta sthalams (temples wherein God is worshipped in the form of one of the great elements of air, wind, water, fire and earth). In this temple, Lord Shiva is in the form of the element of water, which continually bubbles forth from the springs in the sanctum sanctorum. There is also a Shiva Lingam3 in the temple, which has a beautiful story surrounding it, involving a spider and an elephant. It seems both the spider and the elephant were devotees of Lord Shiva. Every day both the spider and the elephant would visit a natural Shiva Lingam located deep in a forest in Trichy. Out of devotion, the spider would spin a web over the lingam to give it shade. Similarly, the elephant would come and offer the lingam abhishekham4 by spraying it with water from his trunk. Each day the spider would come to find his web ruined by the elephant’s spray, and everyday the elephant would find the web obstructing his worship. Finally the elephant decided to totally destroy the web. As he was doing so, the spider climbed into his trunk. With this clashing of egos, both the elephant and the spider died. But at the moment of their death, Lord Shiva appeared before them and explained to them how they in fact were both brothers in devotion. It is said that in his next birth the spider was born as King Kochchengan, the builder of the Thiruvanaikkaval Temple. Interestingly, the sanctum sanctorum of the temple has been constructed in such a way that no elephant would be able to enter it. The entrance is very low, has a very small vestibule and the lingam itself resides in an even smaller chamber. It is also said that even if the Kaveri River dries up in the peak of summer, the water within this chamber is ever bubbling forth. Thus, there is water surrounding the lingam year round. Three of the four Nalvars5 have sung in praise of the Lord in the Thiruvanaikkaval Temple in the Devaram, a collection of devotional verses about Lord Shiva. Fearing the demon Karan (of the Kara-Dhushana duo of the Ramayana), the gods are said to have taken the form of ants to worship Lord Shiva in the form of this Shiva Lingam. 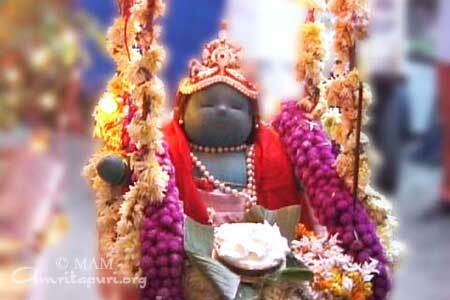 As such, one can see that the lingam tilted forward in order to accept the worship of his tiny devotees. 1 In Vishnu Purana, Vishnu will be taken as the All-powerful Lord and the other gods will be as subservient. In Shiva Purana, Shiva will be the All-Powerful, etc. As the ultimate reality of God is one of pure consciousness, this is not a contradiction, but merely a way of presenting the Almighty in various forms so as to conform to the mind sets of various groups of people. 2 Vibhishana’s response stands in sharp contrast with the story of the Gokarna Shiva Lingam, which Ravana was tricked out of in a similar fashion. Ravana could have cared less who had tricked him out of the Shiva Lingam. And in his anger and frustration, he tried to rip it free from the soil, only succeeding in twisting a piece of it into the shape of a go karna [cow’s ear]. 3 An obelisk-shaped abstract representation of Lord Shiva. 4 Ritualistic bathing of a sacred object. 5 The four Nalvars (literally meaning “four respected people”) are the most esteemed of the 63 Nayanars, the famous Shaivite saints of Tamil Nadu. The town of Kovai (also known as “Coimbatore”) is situated at the base of the Nilgiri Hills on the western boarder of Tamil Nadu. It is centred around an ancient temple dedicated to Koni Amman. From the name of this goddess alone the name “Kovai” evolve. 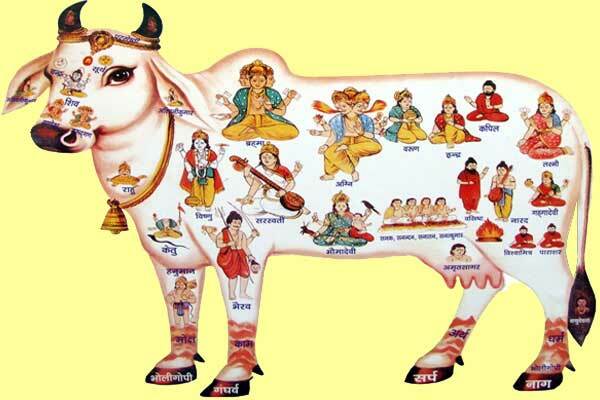 According to the Puranas, two of Lord Shiva’s most precise gifts to humanity were Kamadhenu and the Kalpataru—a wish-fulfilling cow and tree, respectively. For ages, these two miracles of the Lord would bestow upon anyone anything they wanted. Eventually, however, Kamadhenu grew tired of people constantly asking her to fulfil their worldly desires, and she asked the Lord if he would permit her to retire. Lord Shiva agreed and told Kamadhenu that in her next birth she would be born as an ordinary cow and that he would come to her personally to bestow liberation upon her. In her next birth, Kamadhenu bore a calf. One day the two of them were grazing in a forest in Perur (about 10 km from Kovai). As Kamadhenu’s calf frolicked about, its legs struck an anthill and it became stuck. The calf began crying, and Kamadhenu came running to free her child. But being an ordinary cow, there was nothing she could really do. Finally, out of desperation, Kamadhenu drove her horns down into the anthill. When she raised her head, one horn was covered with blood. Kamadhenu immediately realised that this was not an ordinary anthill but, in fact, was storing her Lord in the form of a Shiva Lingam1. In reverence, she immediately expressed her milk over the anthill, thus performing an abhishekham2. Lord Shiva, then appeared before Kamadhenu and, as promised, bestowed her with liberation. After some time, a temple was erected around this Shiva Lingam. 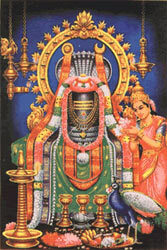 Today that temple is known as Perur Patteshwarar. And if one looks at the Shiva Lingam, one can still see where it was pierced by Kamadhenu’s horn. It is also said that two Tamil saints attained liberation in Perur, and this is eternally reflected by Mother Nature in that palm trees grown in the area have abnormally long lives and, on the converse, tamarind will not sprout there3. This is symbolic of how the saints transcended samsara, the cycle of birth and death. Another story that took place in Perur involves Sundara Murti Nayanar, one of the 63 Nayanars [Shivite Saints of Tamil Nadu]. 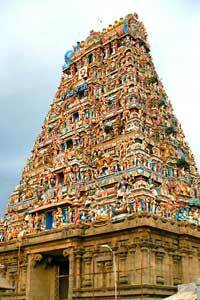 The story goes that Sundara Murti Nayanar would regularly travel to Perur to visit Lord Shiva. As per the divine play of this Saint, each time he met Lord Shiva there, he would only ask him for material things—gold and jewellery, etc. Finally, Lord Shiva wanted to teach the Nayanar a lesson. So he left his abode, and told Nandi, his devoted bull, that the next time the Nayanar came looking for him that he should not tell him that he and his consort, Goddess Parvati, had gone out. But when the Nayanar came, Nandi did not feel he could completely lie to him. On the other hand, neither could he disobey his Lord. Therefore, when the Saint asked where Shiva and Parvati were, Nandi simply turned his head, looking back over his shoulder. From this, the Saint was able to infer that the divine couple indeed had left and were somewhere behind him. He immediately set off to find them. In fact, Shiva and Parvati had assumed the guise of two farm hands and had spent the entire day working in a nearby field. When Sundara Murti Nayanar came across them, they were in the process of supplicating to the farm owner for their day’s wages. Seeing his Lord supplicating to a farmer for money was too much for the saint. He quickly approached Lord Shiva and asked him what he was doing. Shiva told him that as he did not have any money he was doing his best to obtain some. Although Sundara Murti Nayanar was shaken, he was not completely freed from his obsession with money. And when he took leave from the Lord, he once again asked him for riches. At this point Lord Shiva spoke frankly, “My son, do you want my money or my grace?” Finally, the Nayanar realized that he had been a fool to ask the Lord for something as trivial and perishable as money. He immediately fell to his knees and asked him for grace and grace alone. There is another name for Perur, and that is “Mela Chidambaram” [“Upper Chidambaram”]. Located approximately 250 kilometres southeast of Coimbatore, Chidambaram is home to a one of India’s most famous temples. In fact, the temple’s original idol is not even an idol as such, but Akasha Deva—space itself. Therefore, when one enters the temple grounds, they are said to verily be entering God. The legend goes that two saints—Patanjali and Vyaghrapadar—were performing austerities in Chidambaram. Pleased by their devotion, Lord Shiva spoke offered them a boon. They requested him to reveal himself to them. Lord Shiva told them that he was in fact pervading everything they saw in the form of consciousness. But the saints were not happy with this answer. They told Shiva that while they knew what he said was true, they still wanted to see him in a human form. The Lord agreed and immediately manifested as Nataraja, the King of Dance. Then, the Lord began to dance, and when the Lord’s heel struck the ground, a piece from one of his chilankas [belled anklets] broke off and went flying. It landed 250 km away in Perur—thus giving the town its second name. One final legend from Coimbatore District surrounds the Avinashi Lingeswarar Temple (about 30 km from the town of Kovai). This story also involves Sundara Murti Nayanar. Once, when the Nayanar was passing through Avinashi, he heard two discordant sounds coming from opposite houses—one reflecting joy and the other, sorrow. It seemed that three years earlier, two boys of the same age were bathing in a nearby water tank when one of them was devoured by a crocodile. The boys were five years old at the time. On that day, they both would have been eight. As such it was time for their upanayanam samskara [sacred-thread ceremony]—hence, the joy in the house of the living boy and the anguish in the house of the dead boy. Sundara Murti Nayanar was extremely moved by the sorrow of the dead boy’s parents. Therefore, he spontaneously broke out into a prayerful song to Lord Shiva, begging him to resurrect the dead child. His prayer was answered. Rain clouds quickly gathered and poured forth, filling the empty tank with water. Soon, the tank overflowed, expelling the infamous crocodile. The croc then regurgitated the child—an unharmed eight-year-old boy. The story is further reflected by the name of a nearby Coimbatore town—Karuvalur. “Karuvalur” means “raincloud” in Tamil. It is said that when Sundara Murti Nayanar prayed for the boy’s resurrection, that the clouds formed over this town. Hence its name. 1 An obelisk-shaped abstract representation of Lord Shiva, often black and made of stone. 2 Ritualistic bathing of an idol or divine image as a form or worship. 3 Normally, all one has to do is to drop tamarind seed on the ground and within a few days it will sprout. In the Puranas, Lord Shiva is the guru of his divine consort, Parvati Devi. The legend says that once when Shiva was imparting wisdom to Goddess Parvati, she became distracted by a beautiful peacock. Shiva then cursed her to take birth as a peahen, telling her that he would join her after she worshipped him in the form of a Shiva Lingam3under a Punnai tree. After many years of searching, the peahen finally found such a Shiva Lingam in Mylapore (Southern Chennai). She then worshipped her Lord in this form, offering him flowers that she carried in her beak. Fulfilling his promise, the Lord then appeared Parvati and reunited with her. The story shows how when we become enamored with the objects of this world (the peacock) and forget their divine essence (Shiva), we remove our self, as it were, from God. But as soon as we remember the divinity inherent in the world and its objects, we are immediately reunited with the Supreme. There is another story associated with this temple, this one involving the Shaivite Saint Tiru Jnanasambandar Nayanar4. The story goes that one day a girl by the name of Poompavai was gathering flowers in a garden for the daily worship when she was bitten by a poisonous snake and died. Her father, a merchant named Shivanesan Chettiar, had deep faith in Tiru Jnanasambandar. After her cremation, Shivanesan Chettiar placed his daughter’s ashes in a pot with the firm conviction that the saint would resurrect her when he came to through the area in the near future. Indeed, when Tiru Jnanasambandar to the Kapaleswarar Temple, Shivanesan Chettiar approached him with his daughter’s ashes. Hearing the man’s sad tale, Tiru Jnanasambandar heart overflowed with compassion. He then broke out in a spontaneous 10-versed hymn in praise of Shiva in the form of Kapaleswarar5. When he reached the final verse, Poompavai emerged from the pot alive and well. Tiru Jnanasambandar did not cast even a glance at Poompavai, the beautiful young lady he had brought back to life. Instead, he attributed the miracle to the grace of Lord Shiva, claiming no responsibility of his own. Shivanesan Chettiar offered Poompavai’s hand in marriage to the saint, but he gently declined and continued on his pilgrimage. It is also said the Sri Rama stopped at the Kapaleswarar Temple on his way back from Lanka. 1 Kapaleswarar (kapala + iswara) literally means “The Lord with the skull-bowl.” Here, Shiva is depicted standing with an ascetic’s bowl in the form of a skull in his hand. The skull is supposed that of the fifth head of Lord Brahma. Shiva is said to have plucked off Brahma’s fifth head after feeling him to be arrogant. Brahma represents the creation principle, and Shiva represents destruction. The story symbolizes how everything that is created must one day be destroyed. Furthermore, Shiva’s kapalam represents how the universe at end of a cosmic cycle is resolved into seed form. Then, from this kapalam, eventually springs forth the next creation. 4 Tiru Jnanasambandar was on of the primary four of the 63 Nayanars, the Shaivite saints of Tamil Nadu. He is said to have lived around 650 CE. 5 The Poompaavai Patikam is still available today.